Phnom Penh’s pivot toward Beijing has less to do with the United States than hatred for Vietnam. Americans have been left to ask: What did we do wrong? What has caused the leaders of Southeast Asia to turn away from Washington and toward Beijing? It is tempting to look for the answer to these questions in the policies of the Obama or Xi administrations, or blame it on shifting fortunes in the balance of power. But focusing on the spectacle of Sino-American rivalry masks the dozens of smaller dramas and power plays that usually escape the attention of Western observers. Often it is these smaller conflicts of interest that drive lesser powers into the arms of the great ones. There is no better example of this than Cambodia, one of the first countries in the region to openly align itself with China. Cambodia’s position became clear in 2012, when it prevented ASEAN from issuing a joint communiqué that mentioned the South China Sea. Long-standing Cambodian dictator Hun Sen has reaped many rewards for this decision: In October, China granted Cambodia $237 million in direct aid, $90 million in canceled debt, and an additional $15 million in military support. Yet there is more behind Cambodian support for China than the size of Beijing’s pocketbook. In the minds of many Cambodians, the most difficult geopolitical challenge facing their country is not balancing the demands of the United States and China, but managing its relationship with Vietnam, an undertaking that cannot be successful without Chinese cooperation. Ethnic disharmony is not hard to spot in Southeast Asia, but few of its prejudices — outside of the Myanmese hatred toward the Rohingya, at least — can match the distrust and disgust the average Khmer feels toward the Vietnamese. Recall how conservative Americans talked about the Soviet Union at the height of communist power, add the way their counterparts in modern Europe discuss Arab immigration now, and then throw in a dash of the humiliation that marked Germany in interwar years, and then you might come close to getting a fair idea of how wild and vitriolic a force anti-Vietnamese rhetoric is in Cambodian politics. Cambodians have not forgotten the centuries of warfare that led Vietnamese armies to pillage the Khmer heartland and strip away more than half of its territory. Cambodian nationalists still pine for Khmer krom (“Lower Khmer”), a term used to describe both the ethnic Khmer living outside Cambodia and the lands they inhabit. Without the intervention of the French in the 1860s, which transformed Cambodia into a French protectorate and southern Vietnam into a French colony, Cambodia would have been totally swallowed by the Vietnamese maw. French imperialism brought peace, but not harmony: Relations between the two groups only worsened under colonial control, as the French gave the Vietnamese a privileged status, and imperial policy supported Vietnamese migration to the Cambodian heartland. The subsequent governments that came to power in post-colonial times — the Sisowath, Lon Nol, and Khmer Rouge regimes — relied on anti-Vietnamese rhetoric to legitimize their rule to the Cambodian people. Historically informed Cambodians are quick to point out that the Khmer Rouge was a creation of the Viet Cong; the more conspiratorial of their countrymen insist that the Khmer Rouge’s massacres were directed by them as well. Conspiratorial or not, Cambodians remember that 150,000 Vietnamese soldiers invaded Cambodia in 1978 and then occupied their country as foreign conquerors for the next 10 years. Though that decade-long war was not entirely the fault of the Vietnamese (China, Thailand, and the United States would support their own armed proxies), the violence of Vietnam’s counterinsurgency operations slowly eroded what goodwill they had earned by removing the Khmer Rouge from power. During this time the spigot of Vietnamese migrants moving into Cambodia was opened once again, sharpening fears that Vietnam sought to permanently subvert Khmer autonomy. Although both Vietnamese immigration and government influence has waned since Hanoi ordered its troops to withdraw from Cambodian territory, distrust of Vietnam’s government and disgust toward Cambodia’s Vietnamese minority remain. You can see this even in the Khmer communities of the United States. To walk the streets of an American Cambodiatown is to see a half-dozen posters warning of Vietnamese aggression, or (if you speak Khmer) be pressed to attend activist get-togethers or donate to help fight Vietnamese imperialism. To walk the streets of an American Cambodiatown is to see a half-dozen posters warning of Vietnamese aggression, or (if you speak Khmer) be pressed to attend activist get-togethers or donate to help fight Vietnamese imperialism.Many of these donations go straight into the coffers of the Cambodia National Rescue Party (CNRP), the opposition to Hun Sen’s ruling regime. The CNRP faces a stacked deck when squaring off against hostile authorities, but anti-Vietnamese agitation is a game they can’t lose. When the Vietnamese overthrew the Khmer Rouge, the man they chose to head their new puppet regime was none other than Hun Sen. The party he now heads is a direct descendant of the party the Vietnamese created to rule Cambodia. While Westerners sometimes call Hun Sen a Chinese puppet, his domestic enemies are far more likely to attack him as a Vietnamese figurehead. His regime’s abuses are regularly blamed on Vietnamese designs — I have friends who insist that the soldiers who broke up the January 2014 election protests were all Viet — and everything from the prime minister’s fluency in Vietnamese to his refusal to deport all ethnic Vietnamese from Cambodia is used as irrefutable proof of his traitorous intent. There is a kernel of truth behind these accusations. Hun Sen has worked hard to nip anti-Vietnamese sentiment before it grows to explosive (or violent) levels, and he has proven extremely hesitant to rock the boat with his old — and far more powerful — patrons in Hanoi. Hun Sen no longer tolerates organized attempts to use anti-Vietnamese rhetoric against him. Last month, in response to a 2016 CNRP media campaign designed to expose Vietnamese incursions into Cambodian territory, Sam Rainsy, former head of the CNRP, and Sok Hor, a CNRP senator, were sentenced to five and seven years in jail, respectively. Likewise, Hanoi still has a powerful voice in Cambodian affairs. The Vietnamese state-owned enterprise Viettel operates the only Cambodian telecom company whose coverage reaches across the entire country, Phnom Penh constantly needles away at boosting cross-border trade and investment with Vietnam, illegal Vietnamese logging and smuggling operations are tacitly sanctioned by the government, and with the occasional diplomatic warning aside, the government turns a blind eye to Vietnamese construction near the areas where the two countries’ border has not been clearly demarcated. However, Viet-Cambodian relations are no longer what journalist Sebastian Strangio labeled the “quasi-colonial relationship” of Hun Sen’s early years. Hun Sen is no longer accompanied by Vietnamese minders while on government business, nor must he report his decisions to Vietnamese commanders. It is within this context that Sino-Cambodian relations must be understood. In geopolitical terms, Beijing’s flowering relationship with Phnom Penh is a powerful check on Cambodia’s neighbors. The United States, a longtime ally of the Thais and newfound courter of Vietnamese affection, could not be trusted to put Cambodian interests above the other powers in the region. In Beijing, the Cambodians see a more reliable great power — an ally that not only has a fractious relationship with Cambodia’s traditional enemy, but one that has demonstrated a willingness to go to war with that country to preserve a favorable balance of power in Southeast Asia. Indeed, the last war China waged was not only against the Vietnamese, it was against them in defense of Cambodia. Beijing’s decision to send troops across Vietnam’s northern border as the bulk of the Vietnamese army was fighting an insurgency in Cambodia, and then to keep a threatening military presence on that border through the next decade, badly hampered the Vietnamese push to become the premier armed power in Southeast Asia. For Cambodia, the strategic benefits of friendship with China could not be clearer. Playing spoiler in ASEAN meetings is a small price to pay to guarantee this friendship. The CNRP, acutely aware of its image in Western circles, has since distanced itself from Rainsy’s comments, but his logic is solid. If Vietnam truly does threaten the sovereignty of Cambodia, closer relations with China is a geopolitical imperative. Cambodia’s politicians have depended, since French colonialism if not earlier, on foreign sponsors. But being tarred as a friend of the Vietnamese is the most toxic slur in Cambodian politics. For Hun Sen or Rainsy, leaning toward China doesn’t send a message of dependence on Beijing, but of hostility toward Hanoi. Even radical changes in Cambodia’s internal politics are unlikely to produce a revolution in Cambodia’s foreign relations. 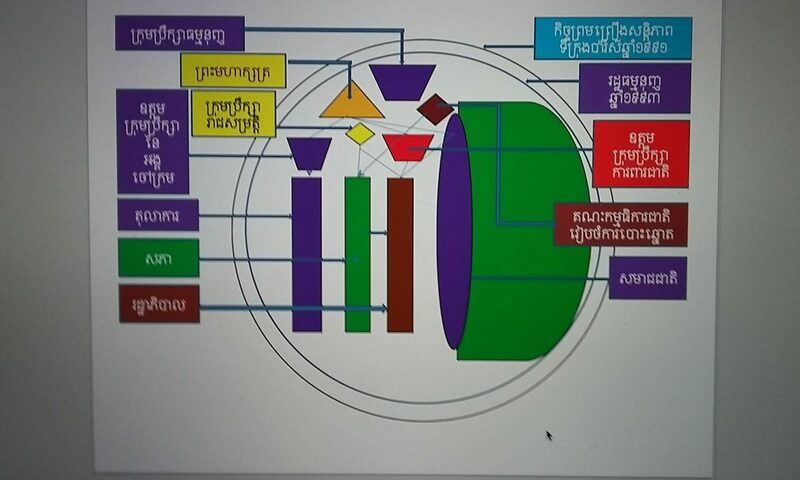 Hun Sen’s patronage machine requires huge influxes of money to maintain. China provides that. It does so without asking Hun Sen to protect the liberties of average Cambodians in return. But even if the machine were to fall apart and the opposition were to rise to power, Cambodia’s new leaders would face strong political pressure to give Beijing pride of place. Cambodia is a small country tucked between its historical enemies. The grip anti-Vietnamese sentiment has on the Cambodian masses only strengthens this geopolitical anxiety. As long as Cambodian nationalism defines itself in opposition to the Vietnamese, Cambodian politicians will never stop searching for a great power that can stand as a bulwark against Vietnam. For the foreseeable future, that country will be China. Next to this, the perceived balance of power between China and the United States will never be anything more than a sideshow.